5-7 minute walk to bottom of Royal MIle/Palace& tourist attractions. Having a preference for self catering holidays since my children were young, I like to think I know what extra touches make a good holiday in to a great one and I hope that is what everyone will experience staying at my Apartment. I have lived in Edinburgh most of my life and really love the City and all the diversity that it has to offer and I hope you will enjoy it also. The location is very central with many of the tourist sites with a short walk and therefore no need for a car not even for self catering as there is a large supermarket with ATM and Pharmacy open till 10pm every night beside the apartment.It also has a good bus service from the main road. Most of all it is a safe quiet area. When you chose self catering I think it is important to be able to shop for food easily. This apartment has a supermarket just beside it. It is also well served by many buses from the main road to allow you to experience all of edinburgh and beyond from the zoo in the west to seaside in the east without the extra cost of having to hire a car. A car is not required due to the central location, however if you are coming by car there is a free dedicated off road parking space at the apartment, so no parking fees. Holyrood Palace and Park and the Royal Mile are only a 5 -7minute walk away. Main Bathroom; Bath and electric shower over bath, wash hand basin and toilet. En-Suite; Electric Shower, wash hand basin and toilet. Lounge: Two leather Sofas, Cable T. V, Wwi, Dvd Player and dvd's, Cd player and cd's, side tables, coffee table, lamps, toys books, child's chair. Coffee, sugar, teas including fruit teas,butters, jams and marmalades,cereals, milk, orange juice, bread,cooking oil, sauces and spices all supplied. Full cooker with gas hob and electric oven, fridge/freezer, washing machine, (not a dryer) clothes airer microwave, kettle toaster, coffee maker, crockery, cutlery, pots &pans, table&chairs, iron. Hillend Dry Ski Slope; 13.1mile; 20 minute drive. Craigentinny, Portobello and Duddingston Golf Courses all within a 15-20 minute drive. Notes on accommodation: Non smokers only Anyone arriving and promising they will smoke outside is not a non smoker and will forfeit their booking and be unable to stay. Outside: Outside shared garden and chairs provided. Utility Room: Iron and ironing board, hoover, cleaning products, umberella, garden chairs. 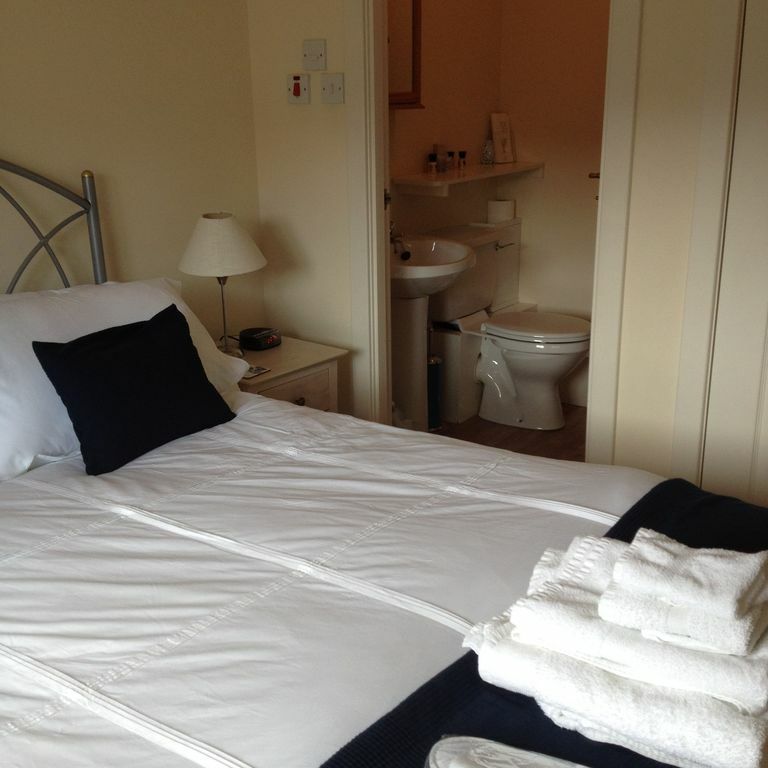 Cleaning / Towels / Linen / Maid service: All towels and linen are included. All bedding is Hypo-allergenic. Other: Dining room; walnut dining table with 4 chairs. High chair. Fantastic apartment. Thank you Carol. We loved the convenient location, both for the shopping park right across and the quick ride to the Royal Mile. Accommodations and amenities were wonderful. My only advice is that the bedrooms may need new mattresses soon. Thank you for your review , I am glad you found the apartment fantastic. All the mattresses are orthopaedic as that is best for back health but they can be a bit firm for some people which is why I put thick toppers on top so that people can make the choice. The double bed is a new bed recently so new in fact that I haven’t changed the advert picture yet and the twin beds are two years old. It’s a difficult one as it is personal taste really. Great apartment in a perfect location! Carol's apartment is great and she is a fantastic host! She was there to greet us after an all night flight and was very flexible re: our arrival time. We stayed for 3 nights on arrival and also for our last night before heading home. We've stayed in many VRBO's and this was definitely on the top of the list. Carol provides everything you need including breakfast foods, coffee and tea. It is next door to a small shopping center with a supermarket and a bank which was very helpful. It's about a 10 minute walk to the beginning of the Royal Mile but far enough away that it's very quiet at night. We will definitely stay there again when we return to Edinburgh! Carol met us on arrival and showed us all the details of the apartment. It is very well equipped; we really appreciated the breakfast supplies and other items for our personal comfort! The location was quite convenient, and Sainsburys was a two minute walk away. Thank you Carol! You are very welcome, I am glad you had a good stay and hopefully see you another time. The apartment was ideal for walking to Holyrood Palace, the Royal mile , Arthur's seat and the Fringe Festival for us. It is close to Sainsburys and KFC. You have a view of Arthur's seat from the bedrooms it is lovely and quiet. Carol met us there and showed us around the flat. Added little touches of a wee dram, milk, tea, coffee, sugar, jam, butter , bread, and cereals were all very much appreciated. Towels and face cloths supplied, shampoo and conditioner, bedding, dvd's TV, hairdryer and of course WI-FI - overall we had a brilliant stay and would highly recommend this flat. It takes about 25 - 30mins walking to Cowgate in Edinburgh city centre - Would stay again. This place was perfect for us. Within walking distance to some of the sights on the Royal Mile, and very convenient to the Hop on Hop Off buses as well. Carol was very accommodating to our schedule and even personalized her home for us! We will definitely stay again when we next come back to Edinburgh! Thank you for your kind words. Would be delighted to have you back anytime. Very good plenty of room and very clean. We had a lovely few days .Apartment very good. Holyrood Palace and Park, Royal Mile, Dynamic Earth, Scottish Parliment; 0. 5 mile; 7 minute walk. City Centre and Princess Street; 1.3miles, 4 minute drive. Sainsbury Supermarket beside the apartment which has an ATM, Pharmacy, Post box and is open until 10pm every night. Restaurants and speciallity shops also here. Bank and Post Office at Abbeyhill 5 minute walk. Cinemas, theatres, swimming pool, children's play park, zoo, ice rink, either nearby or with easy transport links from the main road at the apartment. Booking Notes: Payment either by Bank transfer 4 weeks before arrival or in cash on arrival. Refundable security deposit of 100GBP required on arrival and returned to you should no major damage occur. GBP only accepted. Marathon, Rugby and School Holidays will incur a small surcharge payable on arrival. Changeover Day: Flexible change over day. Check in is between 1400 and 1500hours and I will meet you and show you round. However arrivals after 1800 will be charged £30 payable on arrival.If this arrangement is not suitable for you then my apartment is not the right one for you. Notes on prices: Prices are based on 2 people having sole use of the property in either the double bedroom or twin bedroom. If both bedrooms are required for 2people staying the third person rate will apply..Prices for 3rd& 4th person(s) starting at 13GBPpppn. Children under 2yrs free if sharing parents bedroom surcharge if in own bedroom.Cot provided. 5th person using guest bed will be charged at 20GBP pn. School holiday weeks, Rugby, Golf and Marathon weekends will incur a supplement. One night stay prices start at 110GBP per couple..